“B” was born in San Francisco and now resides in San Lorenzo. 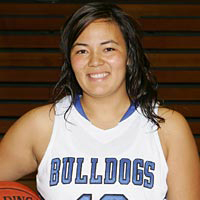 She can play several positions for the Bulldogs. She is a smart player with knowledge of the game. She can play all guard positions and has a great 3 point shot. Her dream jobs are rehabilitating patients from physical injuries and owing a night club. This year she wants to achieve a 3.2 GPA and do the best she can on the court. Her parents are Tammy and Arnell. Her brother is A.J. (19).